'Clayton', the James M. Townsend estate designed by William Lawrence Bottomley c. 1920 in Mill Neck. Click HERE for more on 'Clayton' and click HERE to see 'Clayton' on google earth and HERE on bing. 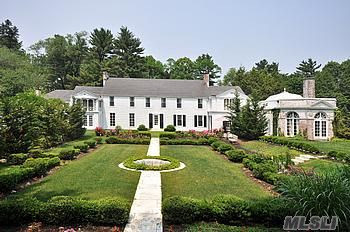 The house is currently for sale for $3,300,000, click HERE to see the listing via Daniel Gale Sotheby's. -Do not install highly polished granite or marble floors anywhere, especially in public rooms. -Avoid at all cost ceiling spot and flood lights if you aren't a galery or restaurant. I agree with Magnus. But those are relatively easy fixes. The interior has the potential to be a real knock-out. I love the mirror strip pilasters in the "ballroom". I am a big Bottomley fan, but would have altered the exterior of the original house to a greater extent to better coordinate with the additions. Was the house originally shingled but now wide clapboards on the main block? What Magnus and Devoted said. Esp. the lights and floors. Esp. the floors. (One of those damnable shows on HGTV that teach us how to badly renovate and redecorate using the sponsor's cheap products features a woman named Candice Olsen, whose first solution to every job is to put those lights in the ceiling, no matter what the room. I suspect that devoted is right, and that alone with the shiny floors came an over-whitened facade. But, isn't that greenhouse potting shed a delight? The Normandy influenced potting shed is utterly charming with the white washed brick. It is far more enticing than the entry facade of the main house (in my lowly opinion) with the no-so-happy clapboard colonial center hall bookend with brick wings. The rear facade facing the lawns is better - perhaps simply because of the absence of all that painfully dull asphalt drive. Good man, if you're rich look into light brown pea stone. No exceptions. The odd very low rising curved stair entry outside at the forecourt is that original? It seems so unplanned and further complicates what little harmony ever existed. Not Bottomley's finest hour if you ask me relative to his architectural portfolio. 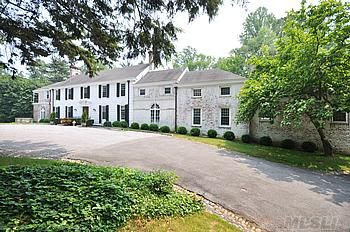 Speaking of Bottomley there is another home he did which oddly the listing firm makes no reference to him. The house is cited in the recent catalogue on his works. Looks like black Belgian marble - possibly original. Kellsboro Jack, looking as best I can at the 1921 photos Zach posted of ‘The Other Clayton’ I don’t think those curved stairs leading up to the front door seen in the color photos today are original to the house. It’s difficult to make out exactly how one got up to the front door in 1921 but it appears to be something fairly simple. I also suspect the 1921 door was a single door & not those double doors there today. • The house had a softer look in 1921 with some ivy growing up its side, front & back & you can see that in 1921 the forecourt had a landscaped center (with possibly a small fountain); & yes, it does look like pea gravel instead of pavement then. • The garden in back is more formal than before, which is nice; the house would look better on this side if the second story shutters were still there. • The one change that should be changed back is on the front side: each second story outside window is missing its outside shutter – why would someone do that? 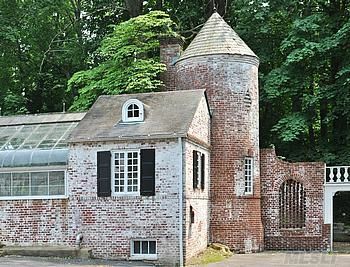 Before the remodel by Bottomley supposedly house had been fashioned after Marie Antoinette's rustic farm/playhouse at Versailles. Which might explain the greenhouse and Guest House. Taxes in 1999 were $4,200 - 2011 $11,750.62! 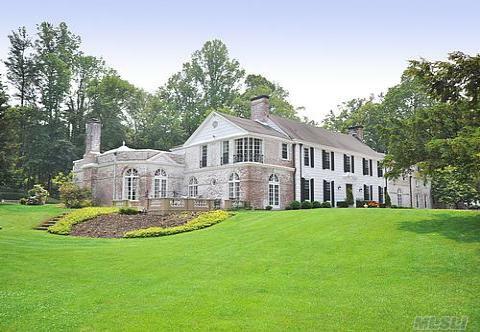 Only $3.3MM for seven Mill Neck acres? I suspect there are some severe problems with the house that dictate that price; God knows the economy is bad, and the seller's motivation unknown, but still...the absence of photos of the pool & cottages is telling. Security word - binaw: to chew with both setts of molars simultaneously. LGB- they are promoting this offering as being "priced to sell". A la its below market value and yet with some problems aside from visual cohesion. Still a good buy. Someone who can put down 3 mill for a house surely has the extra cash for what repairs may be needed. The photos shown do not show a house in great disrepair....maybe this is simply a case of someone landing a deal due to circumstance. The ballroom/music room floor is not polished or Vegas-style. It is original and made of a pressed material...perhaps cork. The rear shutters were removed for replacement and haven't as yet been hung. The 2 outer shutters that are missing can not lay flat since the install of the new copper scupper boxes on the gutters. And finally there is no asphault in the front courtyard. It is grey pea gravel. The drive which is too steep to hold gravel is asphault. The house is being sold because I am a boater and plan to move to the water in the area. I live in and own this home and adore every thing about it. I make every effort to keep it's original charm when repairing and restoring it. Being a guest at a summer party here I was able to view this magnificent property and can report first hand. This property is absolutely breathtaking. The serene setting and formal gardens are delightful. The main house is in great condition, well maintained and the character preserved. The amenity of central air conditioning was added and rarely found in these vintage homes. There are pool photos and cottage photos online. The pool is beautiful and the cabana's architecture is so perfect. There is a superb flow inside and the ball room is absolutely one of a kind and preserved properly in every way.